1. 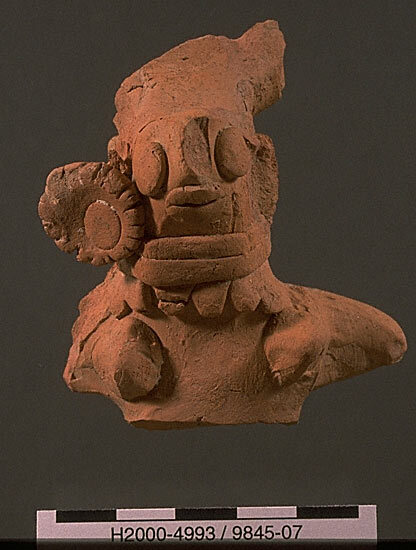 Female figurine (H2000-4993/9845-07) from Trench 43. 2. The hair of female figurines is sometimes bound up in a sort of "turban". 4. 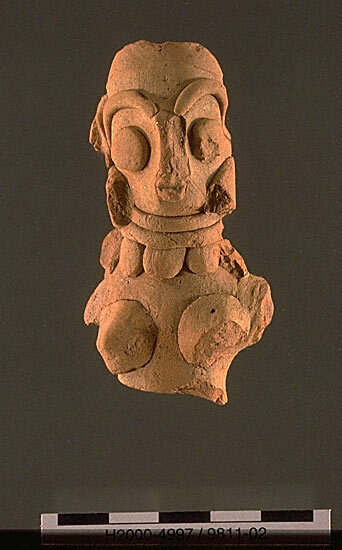 Female figurine (H2000-4997/9811-02) from Trench 43. Matrolocality in Harappa? What does that mean? Women are very important in the social hierarchy, and it may not be unrelated that most figurines like these found in Indus cities like Harappa are of women. First, the evidence: "Of particular interest" writes bioarchaeologist Nancy Lovell in the recent compendium of new research A Companion to South Asia in the Past (2016), "are the results that point to within-group phenotypic variability at Harappa: in contrast to a high degree of variability among males, females form a relatively homogenous group and have closer affinities to individuals in the later period Cemetery H than to contemporaneous males buried in Cemetery R-37 (Hemphill et al., 1991). Previously it was notes that males from rural sites in the Indus Valley can be discriminated from males in Cemetery R-37 (Bartel, 1979), and these results considered together suggest that matrilocality was a cultural practice long established in the Indus valley (Kennedy, 2000)." (p. 171). The late Kenneth A. R. Kennedy was the leading scientific investigator in bioarchaeology for many decades, and author of the extraordinary memoir God-Apes and Fossil Men: Paleoanthropology of South Asia and distillation of decades of research of the earliest humans and their remains in the subcontinent. Wikipedia defines matrilocality as "In social anthropology, matrilocal residence or matrilocality (also uxorilocal residence or uxorilocality) is the societal system in which a married couple resides with or near the wife's parents. Thus, the female offspring of a mother remain living in (or near) the mother's house, thereby forming large clan-families, typically consisting of three or four generations living in the same place. "Frequently, visiting marriage is being practiced, meaning that husband and wife are living apart in their separate families, seeing each other in their spare time. The children of such marriages are raised by the mother's extended matrilineal clan. The father does not have a significant role in the upbringing of his own children; he does, however, in that of his sisters' children (his nieces and nephews). In direct consequence, property is inherited from generation to generation, and, over all, remains largely undivided. 3. 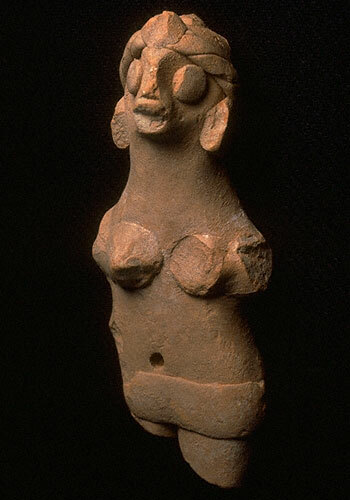 Although most Indus Civilization female figurines are quite curvaceous, some "fat" female figurines are also found. These are often hollow, but sometimes solid. 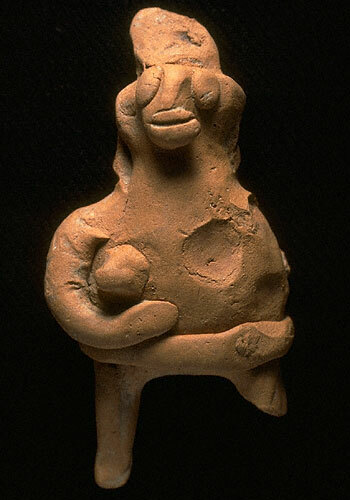 Like other Indus female figurines, some of these "fat" figurines are holding infants at their breasts. They may have been intended to represent pregnant or affluent females. Approximate dimensions (W x H x D): 5.0 x 9.0 x 5.0 cm.